Water aspiration into lungs is when you drink water and it goes down the wrong pipe, into the lungs, instead of going into the stomach. 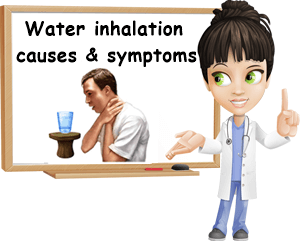 It is also called water inhalation because the water is inhaled into the respiratory tract when taking a breath or pulmonary aspiration from the fact that the water ends up into the lungs. Water aspiration into the lungs results in an immediate sense of suffocation and causes a coughing fit in an attempt to restore normal breathing. Side effects may include an imminent feeling of death and panic attacks and may be life-threatening, causing pneumonia or asphyxia or produce no injury at all. Water inhalation can be just as dangerous as food aspiration into lungs, although the later poses immediate danger of suffocation. The categories most at risk for this include children, the elderly, anyone swimming, patients on ventilation or with medical conditions that have reduced their coughing reflex and swallowing reflex, especially neurological or muscle-related issues. Water aspiration can be severe if significant amounts of water have been inhaled. This can result in what is known as aspiration pneumonia and can be life-threatening if not treated. Good to know: Swimming is a situation of particular interest when it comes to water aspiration. People who go swimming and come to a moment of distress that causes them to swallow too much water are best kept under the close observation of a medical professional or family member, even though they appear fine after the incident. Complications from water aspiration can arise up to 48 hours later and are potentially life-threatening. 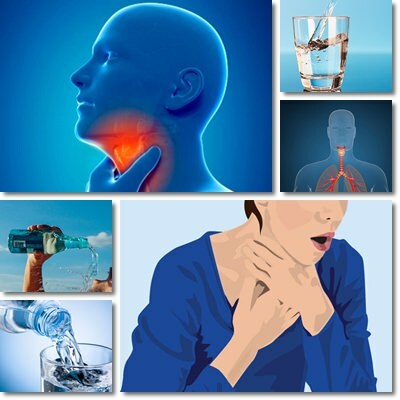 Signs and symptoms to look out for include: incessant coughing, gurgling, swallowing and breathing difficulties, any changes in breathing patterns, fever, lethargy, confusion, chest pain, loss of appetite are all signs of water aspiration complications and require immediate medical attention. How does water aspiration occur? The area of the throat behind the mouth (pharynx) separates into the larynx in the front and the esophagus in the back. The larynx conducts air into the trachea and then the lungs, while the esophagus conducts food into the stomach. On top of the larynx there if a fold of tissue called the epiglottis. When we breathe, the epiglottis stays open to allow air to pass into the larynx and lungs. When we eat or drink water, an involuntary reflex occurs that causes the epiglottis to close so that food and water go into the esophagus and then the stomach. When the epiglottis, for some reason, doesn’t close as it should when we eat and drink, food particles and water escape into the larynx and can be aspirated into the lungs. Food is more problematic because it can cause asphyxia. Small amounts of water are usually expelled rapidly from the larynx via an involuntary coughing reflex. The same reflex can help with food particles, but it’s not as easy as with water. Both water and food particles can accumulate into the lungs and cause an infection known as pneumonia which is the leading cause of complications from food and water aspiration, although not quite the most serious. 1) Lack of attention: trying to drink water and talk, moving around, laughing or being pushed when drinking water. Drinking too much water at once can also cause aspiration into the lungs. 2) Psychological factors: overthinking the simple action of drinking water, trying to control it etc. 3) Anxiety and panic attacks. If you’ve experience a laryngospasm or have had water go down the other pipe at one point, anxiety and panic attacks can make you overthink things or turn to negative thoughts and fear suffocation. A negative mindset can easily disrupt the involuntary processes of breathing and drinking water, making them forced and unnatural and increasing the chances of water accidentally going into the lungs. 4) Drinking too much water or other liquids until you feel full can cause acid reflux and fluids to be regurgitated from the stomach into the esophagus. If acidity is too strong, fluids can rise as high as the back of the throat or mouth from where they can accidentally pass into the larynx and lungs. 5) Being too young. Water aspiration occurs in babies, toddlers and children often because of their underdeveloped swallowing and coughing reflexes or because protection mechanisms like the epiglottis are not mature enough. Fluid inhalation in babies and children is more likely to occur with thin liquids like water or juices. It is common for children to outgrow this issue, but should see a doctor for investigations in any case. 6) Being too old. As we age, muscles lose some of their function, reflexes become slower and protective reflexes become reduced, increasing the risk for event such as water or food aspiration. 7) Gastroesophageal reflux disease, GERD. Irrespective of the causes of gastroesophageal reflux, one of the complications is stomach juices escaping the stomach and rising as far as the mouth. From there, they can be inhaled into the lungs. Being overweight, obese, pregnant, having a hiatal hernia or anesthesia are risk factors for acid reflux and fluid aspiration. 8) Neurological problems. A stroke, brain injury, degenerative diseases of the nervous system that also affect muscle contractions and reflexes such as multiple sclerosis or Alzheimer’s disease can all reduce protective reflexes and cause water inhalation. Requiring a feeding tube increases risks as well. 9) Swimming and swallowing too much water can result in water inhalation which can produce immediate symptoms as well as complications later on, extending over the course of 24-48 hours. 1) Coughing. Immediate and moderate to severe. It is a protective mechanism meant to expel inhaled water from the respiratory tract. 2) Panic sets in at almost the exact time as coughing and is a normal response to the breathing difficulties experienced by water going down the wrong pipe. 3) Trouble breathing normally. The fact that you didn’t get a full breath of air and instead swallowed water into the lungs as well as the fact that you alternate breathing with coughing to expel the water results in abnormal breathing patterns. Some people touch their throat or cover their mouth with their hands instinctively. Symptoms should be temporary and short lived. 1) Constant coughing, with or without mucus. 2) Wheezing, hoarseness, voice changes. 4) Fever, a major sign of infection. 5) Difficulty breathing, abnormal respiration pattern. 6) Confusion, lethargy, loss of appetite, tiredness. 7) Changes in mucus color. These are all signs of a potential pneumonia which can easily develop as a result of repeated water aspiration into the lungs. This is because aspirated water and food particles are not antiseptic and thus have the potential to cause infection. Another serious and immediate complication is asphyxia. Water aspiration into lungs is a potentially life-threatening condition if it obstructs breathing or triggers an asthma episode in people with existing chronic respiratory conditions. 1) Oxygen therapy to counteract oxygen deprivation. 2) Corticosteroid medication to open up airways and allow normal breathing. 3) Antibiotics for a potential infection. 4) The Heimlich maneuver can be performed if necessary. Blood tests, X-rays to identify potential fluids in the lungs may be performed to allow for adequate treatment. Barium tests, neurological exams to identify underlying causes of repeated water aspiration are also recommended. Prevention can be achieved by drinking water calmly, without hurrying or performing other activities that could distract you from the task at hand, taking small sips at a time, sitting upright and treating underlying conditions. Avoiding swimming when it is not advised, on a full stomach or if you have respiratory diseases like asthma or chronic obstructive pulmonary disease are also important for preventing water aspiration into the lungs. Is there a procedure to prevent the epiglottis from staying open when eating and/or drinking? Speech therapy (pharyngeal exercises not helping)? Hello, Rachel. Normally, the epiglottis should open and close automatically, in response to swallowing and breathing. If this doesn’t occur naturally, then chances are there is an underlying medical problem that needs to be solved. It can be something as simple as anxiety disorder which makes you focus too much on swallowing food and water and disrupts the natural reflex of the epiglottis or something more complex such as nerve or muscle damage caused by some form of disease. But pharyngeal exercises could help those with dysphagia, a common cause of water and food aspiration into lungs. It’s really worth a try. Hope this helps. A few days ago while taking a shower my throat suddenly closed up and I could not breathe. As I gasped for breath and swallowed a few small pockets of air bubbled out. I got out of the shower and within a minute was able to pull in air. It was a frightening episode. Should I do anything if this happens again? Should someone do recovery? Are there any exercises I can do to prevent it from happening again? Thanks! Hello, Marilyn. Whenever a breathing difficulty occurs, it’s always recommended to see a doctor and have some tests done to ensure you are healthy and there is no problem with your lungs. If I understand correctly, you felt your throat closing up, then swallowed something and bubbled air came out. It is possible you had a laryngospasm from an allergen or stomach acidity or other causes and, as you gasped for air, saliva or something else went down the wrong pipe. Maybe even water from the shower. But then you recovered and was able to breathe normally. This is what commonly happens with laryngospasms: the airways close up, but in a minute or less they open up again. The hot steam from the shower could have helped open your airways. Coughing helps too and, if you did cough, it could have been from saliva or water that was going down the wrong pipe being brought back up through the coughing reflex. What you can do is see a doctor to know more about what happened exactly and learn you are alright. If this was a laryngospasm that started all of this, you can read our article on Laryngospasms: Symptoms, Causes and Remedies for more information on what causes them and how to deal with them. If it was water aspiration and there is no underlying condition to it (like dysphagia), it helps to just be careful, drink and eat slowly, without rushing, avoid talking while eating or drinking something and things like that. Some say pharyngeal exercises may help. But you need to determine if it was an accident and it just happened some saliva went down the wrong pipe, or if it was a laryngospasm and what it was brought on by. Hope this helps and wishing you lots of health, Marilyn!